Since the first chart was so full of errors, I have had to extensively revise it. * Since it is impossible for two consonants to follow one another in Linear B, the Greek prefix pro must be rendered as poro in Linear B. ** The verb prodokei is an impersonal perfect verb in the third person singular only. All impersonal verbs in Mycenaean Greek are in the third person singular. Some are in the passive. The total number of natural Mycenaean Greek derived (D) infinitives we have posted so far = 407. In this post we find 36 derived (D) infinitives in M in natural Mycenaean Greek. I have not bothered with notes on Mycenaean orthography under M, since there are no new examples of spelling in Linear B peculiar to Mycenaean Greek. Henceforth, I shall add new notes on Mycenaean orthography only as new peculiarities arise, regardless of the Greek letter under which the Mycenaean vocabulary falls. The 4 sentences following Greek verbs in M make it perfectly clear that we are dealing with natural Mycenaean Greek as it was actually spoken. Note that the natural plural in OI is to found in spoken Mycenaean, rather than the singular in O we find almost (but not always) exclusively on the extant Linear B tablets. See infinitives in D for a further explanation for this phenomenon. The total number of natural Mycenaean Greek derived (D) infinitives we have posted so far = 235. I shall indicate the running total as we proceed through the alphabet. In this post we find 35 derived (D) infinitives in E in natural Mycenaean Greek. The 4 sentences in E make it perfectly clear that we are dealing with natural Mycenaean Greek as it was actually spoken. Note that the natural plural in OI is to found in spoken Mycenaean, rather than the singular in O we find almost (but not always) exclusively on the extant Linear B tablets. See infinitives in D for a further explanation for this phenomenon. The total number of natural Mycenaean Greek derived (D) infinitives we have posted so far = 24 A + 12 D + 35 E for a TOTAL of 71. I shall indicate the running total as we proceed through the alphabet. In honour of Michael Ventris for his astounding achievement in his brilliant decipherment of the Mycenaean Linear B script and syllabary, I am taking the first major step on a long journey to recover as much of the corpus of Mycenaean Greek grammar & vocabulary as I possibly can squeeze out of the evidence from extant Linear B tablets and from Book II of Homer's Iliad, above all, from the Catalogue of Ships, in which the most archaic Greek Homer had recourse to abounds. 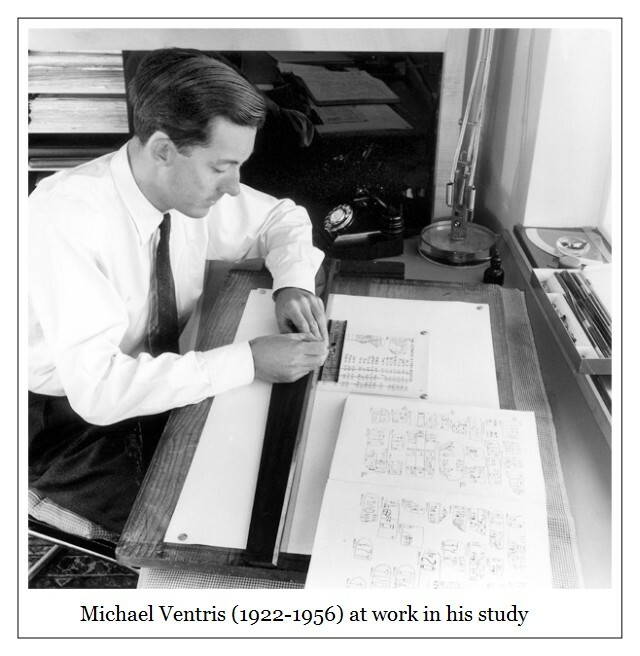 Needless to say, I do all this in honour of the memory of Michael Ventris, one of the greatest geniuses of the twentieth century, a man whose stellar intelligence and prodigious powers of concentration I cannot help but admire in the extreme. In fact, I wouldn't go far wrong in asserting that I practically idolize the man (... might as well tell the truth). 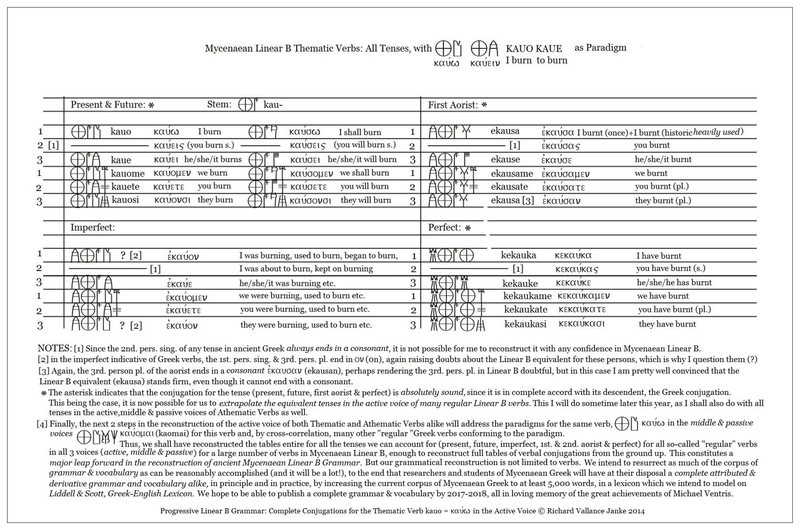 As far as I know, this is the first time that anyone has ever attempted to reconstruct the entire verbal system of all tenses in the active voice of Athematic MI verbs in Mycenaean Greek. Much more is to follow. I shall have reconstructed the middle and passive voices of both Thematic and Athematic verbs by the summer of this year (2014). With this table of all tenses in the active voice of Athematic MI verbs, using the verb "didomi" (I give, to give) as our paradigm, we have succeeded in the regressive reconstruction of these tenses in the active voice from their (approximate) Homeric forms, as used in the Iliad. By regressively extrapolating as many of the “original” Mycenaean forms as we possibly can from their Homeric descendents, we have been able to  move forward to the progressive reconstruction of each of the tenses of the active voice of Athematic verbs, as illustrated in this table. This constitutes the first major step in our long journey to reconstruct as much of Mycenaean Greek grammar as far as we possibly can, for all parts of speech: verbs and adverbs, nouns & adjectives, as well as prepositions and the cases they govern. I have already progressively reconstructed most of the tenses of Thematic verbs in Mycenaean Greek, and will post the complete table shortly. This will finalize our reconstruction of the active voice of the Mycenaean Greek verbal system. But why, I hear you asking, aren't you reconstituting the subjunctive and optative moods? The answer is simple: since Mycenaean Linear B Greek seems to have been almost exclusively used for economic, accounting and fiscal records (including manufacturing and agriculture) and for some religious observances, it would appear that the Mycenaeans did not resort to the subjunctive and optative moods in writing on Linear B tablets, though they certainly must have used them regularly in spoken Mycenaean Greek. A few straggling forms pop up in the Mycenaean Linear B vocabulary, but by no means enough of them to warrant any plausible reconstruction of the  subjunctive and optative moods. As I have repeatedly pointed out, I cannot and will not make any effort to regressively-progressively reconstruct any parts of speech for which there is (almost) no evidence on the extant Linear B tablets. Such an endeavour is foolish and hazardous. The only Mycenaean grammatical constructs we  can safely and reasonably delineate are those for which adequate evidence either appears on extant tablets or which is attested in Homer's Iliad, and above all other considerations, in the Catalogue of Ships in Book II. This is precisely why I am translating the Catalogue of Ships in its entirety, as it is riddled with archaic remnants of Mycenaean Greek grammar, thus serving as the “perfect” (so to speak) point of reference or departure, if you like, for regressive extrapolation of the most ancient grammatical forms to be found in Homer's Iliad into their ancestral counterparts in Mycenaean Greek. I shall also have recourse to the "Idalion Tablet" in Cypro-Minoan Linear C as a secondary point of reference for the reconstruction of Mycenaean Greek grammar, since, as I have already demonstrated, these two very ancient Greek dialects are more closely intertwined than any other Greek dialects whatsoever, including the Attic and Ionic dialects. It is with all of this firmly in mind that I intend to reconstruct as much of the corpus of Mycenaean Greek grammar as is feasibly possible by the end of 2015, after which I will go on to publish my book, Mycenaean Linear B: Progressive Grammar and Vocabulary, sometime in 2016-2017. This volume will not only greatly enhance our knowledge of Mycenaean Greek grammar, but will significantly expand Mycenaean Greek vocabulary, both attested and derived, to at least 5,000 words. Keep posted.